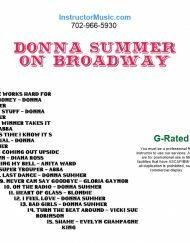 Currently, one of the hottest tickets on Broadway, is “Summer: the Donna Summer Musical”. We built the new fitness mix around the Queen of Disco and we brought some of her friends along for the ride! Another must-see flick of the summer is “Mama Mia! Here We Go Again”. So we had to feature a few beloved ABBA tracks like “Super Trouper” and “The Winner Takes It All”. Other highlights include “Hot Stuff”, “This Time I Know It’s For Real” and “Bad Girls”. Friends of Donna such as Anita Ward (“Ring My Bell”), Blondie (“Heart of Glass”) and Diana Ross (“I’m Coming Out Upside Down”) make this mix a must for retro lovers! This mix is G-Rated. The new custom workout mix by Marianne is full of tried and true classics showcasing the “Philly Sound” that was so influential in disco’s heyday. There are also a few great tracks she wanted from the 80s mixed in for good measure. Highlights include “All Around the World”/Lisa S., “Groove Is In the Heart”/Dee Lite and “T.S.O.P” (the Sound of Philadelphia). That one will definitely take you back to watching “Soul Train” on Saturday mornings! This mix is PG-Rated. 7. A Love Bizarre – Sheila E.
This spring marks the 40th anniversary of “Saturday Night Fever” and that amazing soundtrack! The recent TV tribute to the Bee Gees proved their music is timeless and will be enjoyed by generations to come. The new fitness mix transports you back to the disco to relive the soundtrack that sparked a movement. Every one of the brothers Gibb hits are included, even a couple of number ones by younger brother Andy! Other highlights include disco gems “Bad Girls”, “Turn the Beat Around” and “We Are Family”. This mix is G-Rated. Beth’s custom workout mix takes you back to the days of bell bottoms and platforms. Classic disco hits from beginning to end! Highlights include “Get Down Tonight”, “September” and “It’s Raining Men”. Make sure you “Burn Rubber” and “Heart of Glass”! This mix is PG- Rated.